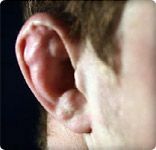 The term cauliflower ear refers to a deformity of the ear caused by blunt trauma or other injury, such as what may occur during a boxing or wrestling match. Left untreated, the injury leads to a blockage that prevents blood flow and damages tissue. This results in a bumpy or lumpy appearance on part of the ear, similar to a cauliflower. Early treatment can help prevent permanent deformity. Fortunately, the types of injuries that cause cauliflower ear are often preventable by wearing the right type of protective head gear. The most common cause of cauliflower ear is a hit to the ear -- or repeated hits to the ear -- that leads to hematomas, or small collections of blood that clot and block the flow of blood and nutrients. These can also occur when skin is pulled away from cartilage, the semi-rigid tissue that gives the ear its shape. Usually, cauliflower ear is related to sports injuries, but not always. Any trauma to the ear can cause it. Cauliflower ear can even be the result of an infection in the ear lobe. When blood flow is blocked, the affected cartilage may die and, without the supportive tissue, fold in on itself. Scar tissue may form, contributing to a swollen and deformed look. Over time, the effects may become more prominent, and they may be permanent. The good news is that cauliflower ear can usually be prevented, even after such an injury occurs. Cauliflower ear occurs most frequently in people who participate in close-contact sports, such as wrestling or boxing. In wrestling, for instance, trauma can result from opponents' heads rubbing or hitting one another during matches or from contact with the wrestling mat. Cauliflower ear is also common among rugby players and people who practice martial arts. People who participate in these activities are at higher risk than others. Protective head gear has long been commonplace in these sports. But these injuries can also occur in non-athletes. They may be the result of accidents or physical altercations. They also can be a complication of "high" piercings in the upper area of the ear, through the cartilage, if the piercing becomes infected. The initial symptoms of the types of injuries that lead to cauliflower ear are similar to the symptoms one might experience from blunt trauma elsewhere in the body. You may have swelling, and the area may be red or bruised. So it's important not to shrug off such symptoms if you have received a blow, or multiple blows, to the ear. Prompt treatment can prevent the development of cauliflower ear. But it must be performed before the tissue is compromised by lack of blood flow. If you experience an injury that causes a blockage in the tissues of your ear, there's still a chance you can avoid developing cauliflower ear. The goal of treatment is to ease the blockage so that blood can again flow to the affected tissues. A doctor can accomplish this by making a small incision and draining accumulating blood or removing a clot and preventing further bleeding. He or she may need to reconnect tissues using stitches and apply a special bandage to put pressure on the area. This pressure dressing may need to stay in place for several days to a week. The site will require monitoring for signs of infection or signs that additional treatment may be needed. Your doctor may also prescribe antibiotics. The most important thing you can do to prevent cauliflower ear is to wear the appropriate head gear when engaging in activities that increase your risk for ear trauma, such as wrestling, boxing, rugby, and other close-contact sports. It's crucial to get a proper fit for protective head gear. A helmet that's too loose can slip out of place, leaving you vulnerable to injury. One that's too tight may itself be damaging to the ears, especially as you repeatedly rub it against your ears putting it on and taking it off. Athletes should remember to use protective gear during practices. And those thinking about high ear piercings may want to talk with their doctor first. Another important step in the prevention of cauliflower ear is to be aware of the risks and to have a doctor evaluate any trauma to the ear, even if it seems superficial. Treatment can help prevent the unsightly, often permanent, cosmetic effects of cauliflower ear. But it has to be done very soon after the injury occurs to be effective. Nemours Foundation: "What's Cauliflower Ear?" The Merck Manuals Online Medical Library: "External Ear Trauma." British Medical Journal: "'High' Ear Piercing and the Rising Incidence of Perichondritis of the Pinna." Nationwide Children's Hospital, Sports Medicine: "Cauliflower Ear." ENT Today, Official Publication of the Triological Society (American Laryngological, Rhinological and Otological Society): "Incision, Repair of Ear Hematoma Recommended." Rakel: Textbook of Family Medicine, 8th ed. ; Chapter 19.